Editor’s Note: The following story appeared in the recent issue of Wrestling Insider Newsmagazine (WIN). For additional information on the 1993 U.S. World freestyle team, including a breakdown of results by all ten members of that team, you can receive the issue by calling 1-888-305-0606 or go to WIN-magazine.com to subscribe to WIN either in print, digitally or both. If you want a subscription to start with the August issue where this article appeared, please e-mail the WIN office specifying that. Kevin Jackson, a three-time World and Olympic champion, is looking for a pedestal. On that pedestal are spots reserved for the greatest wrestlers in America. Jackson himself is certainly among those wrestlers deserving of a spot, yet his concern relates to our lack of awareness for wrestling’s greatest champions. With the exception of a few wrestlers who transcend the sport, our best wrestlers live in the shadows. There should also be a spot on that pedestal for a team championship that rarely gets mentioned. This year marks the 20-year anniversary of a historic wrestling team, but no one is celebrating it. At the 1993 World Championships in Toronto, Canada, the United States achieved a notable first: they won a team World title in men’s freestyle. Prior to that the United States could only manage a second-place finish to the powerful teams from the former Soviet Union. The United States began participating in the World Championships in 1961. The Soviets won 22 team titles over a 24-year span, including 19 in a row from 1967 through 1991. What the United States achieved at the 1993 World Championships was groundbreaking, but it was not monumental. The characters from the team, however, remain a colorful and important part of the wrestling landscape in the United States. It is worth mentioning that the 1993 World Championships were the beginning of the end of international wrestling’s peak. It would be the last Olympic wrestling cycle that included 10 weight classes. In 1997, it shrunk to eight weight classes; in 2002 it shrunk to seven; in 2013 the International Olympic Committee recommended the elimination of wrestling from the 2020 Olympic Games. The United States entered the 1993 World Championships with a unique blend of youth and experience. Veterans like Bruce Baumgartner (286 pounds) and Dave Schultz (163 pounds) combined for 14 World and Olympic medals (including four gold) up to that point. Zeke Jones (114.5 pounds), Kevin Jackson (180.5 pounds), and Melvin Douglas (198 pounds) were near the apex of their careers. Jones and Jackson were defending World champions while Douglas had reached the World finals in 1989. And then there were Tom and Terry Brands, identical twins who weren’t expected to be successful because their style was deemed too aggressive for international wrestling. They would prove the world wrong. All in all, the United States had five of 10 wrestlers on the team who made it to the World Championship finals. This was certainly a team capable of winning. Although the United States had one of its best teams entering the World Championships, there were other factors that contributed to the team title. First — and perhaps most importantly — the Soviet Union collapsed in 1991, which meant disarray. Turkey won the 1994 World Championships and the United States won its second World title in 1995 in Atlanta. But Russia found its stride after that; winning nine of the next 12 team championships; including a dominating 2007 World Championship performance which included six gold medals and one bronze medal. Amazingly, they only lost one match the entire tournament. Then, there was the heat. The venue in Toronto was not air-conditioned. The mats were wet from the humidity so it was, as Zeke Jones put it, “like a slip and slide.” Typical turns became more difficult because all of the competitors were sweaty. Americans traditionally thrive on conditioning, which led to fatigue for wrestlers from other countries. Finally, don’t underestimate the importance of the World Championships being in Canada. Travel was minimal and the American team spoke the language. The timing was ideal for the United States to win at the 1993 Worlds. But a team title was never part of the narrative for the United States entering the Championships. It was never discussed by Burnett or the members of the team. Individual World titles were the standard. A team title would be a by-product of everyone achieving their goals. In fact, Zeke Jones doesn’t remember being aware they were going for their first team title until the United States got closer to winning and everyone began talking about it. Four of the 10 wrestlers on the team reached their individual goals. Terry Brands (125.5 pounds), Tom Brands (136.5 pounds), Melvin Douglas, and Bruce Baumgartner were World champions (although Douglas’s championship would come later since the wrestler he lost to in the finals tested positive for a banned substance). Dave Schultz placed second. Zeke Jones, Townsend Saunders (149.5 pounds) and Kevin Jackson placed fourth. Mark Kerr (220 pounds) placed seventh and Rob Eiter (105.5 pounds) placed ninth. The United States scored 76 points, 22 points more than second-place Russia. “We had a group of individuals that believed they could win medals,” said Baumgartner. “It was a pretty harmonious team. There wasn’t a lot of politics or interference on the team. I’m not going to say we were best friends, but I think we all got along pretty well. We all stayed out of everyone else’s business and that’s one of the things about that team. 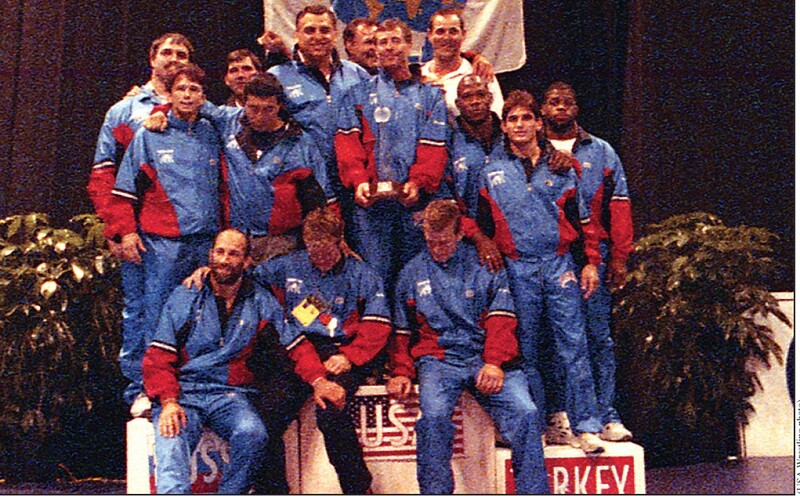 Twenty years later, Zeke Jones is the head freestyle national teams coach for USA Wrestling. Occasionally, he will use a team title as motivation during practice. But the greatest lesson Jones learned from the 1993 team is that it takes a combination of first- (Olympic) and second-cycle wrestlers to be successful at the World Championships. And it takes unity. Regardless of their individual accomplishments, the 1993 World Championship team created a blueprint on how to win. Timing, talent and the right training environment are essential for future success.